Being in the forefront of the cleaning industry since 1984, Perfect Clean has grown to be the most trusted and credible source in the cleaning sector. 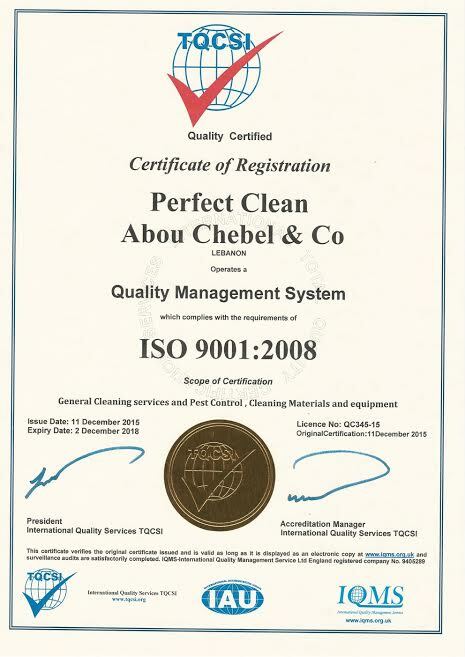 At Perfect Clean Abou Chebel & Co® we pride ourselves in the ability to secure the types of high quality customer services that our clients have come to anticipate and deserve. Based in Lebanon,we are available to serve clients wherever they need our services within the Lebanese territories. Supportedby firm technical know-how, aninnovative approach in providing superior-quality service and specialized professionals, Perfect Clean Abou Chebel & Co® provides, proficient and trustworthy commercial cleaning and janitorial services for all types and sizes of facilities - from small to large offices and commercial centers to industrial, warehouse, retail locations and family units. Furthermore, we have consciously chosen to use specific products from the suppliers that conform tointernationalstandards. Our employees are continuously being trained to perform their tasks in anaccurate, responsible and professional manner. 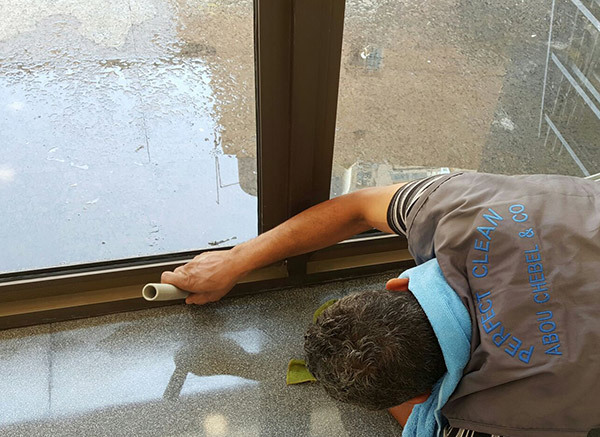 At Perfect Clean Abou Chebel & Co®, we believe that our customer is always our number one priority and leaving "spotless" traces behind is our standard. We are the pioneers in the cleaning industry having been the first cleaning company to be established 1984 and having contributed to the regional culture that the cleaning concept is of the utmost necessity for any establishment's wellbeing. We have insurance that covers civil responsibility and accidents occurring at work or your office. We are member in the Lebanese Chamber of Commerce, Industry and Agriculture. Every employee is carefully trained, re-trained, supervised, and graded to maintain a high work standard. We believe proper, professional supervision is essential in any successful on-site operation in order to note special requests, concerns, safety and maintenance issues. Our cleaning agents work according to a specific scope of work agreed upon with the client. Though our supervisors are well equipped with their own vehicles provided by Perfect Clean Abou Chebel & Co® to carry on their job and constantly be on-site, we follow up their work by sending out the head of the supervising team and an operational manager for a perfect finish. We don't subcontract so we control the training and performance of our team. We look out for the best equipment and products available in the cleaning market to enhance our performance and offer the best at every moment. We have a dedicated staff on board to answer your calls and emails ready to assist you and any issue you might have. We are flexible enough to fit your Schedule depending on your hours of operation and the type of facility you operate in or office. Our regular cleaning is more detailed than that of other cleaning services, leaving spotless traces behind. We customize your house or office cleaning service depending on your specific requirements. 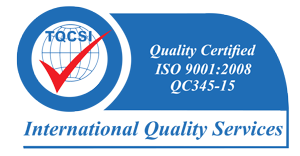 We use enviro-friendly cleaning products that meet international standards and are certified by the ministry of health. If any problem arises rest assured that we have a very high responsiveness and a proactive attitude. Perfect Clean Abou Chebel & Co® is a 24/7 company and are available at all times in case of an emergency. At Perfect Clean Abou Chebel & Co®, quality control is key. If it doesn't measure up to the highest standards it's not part of our company. As simple as that.